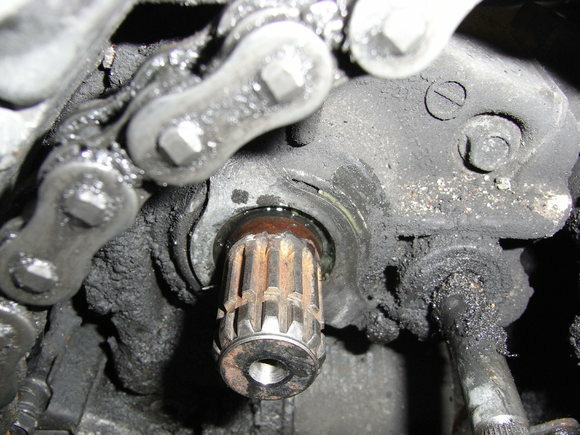 Worn countershaft splines is a known problem on the Transalp. Changing the shaft means dismantling the whole engine. Fix or prevent this with my simple method - for a couple of euros/dollars per sprocket! I have been driving 12.000 km each with my 2 last sprockets "glued" to the shaft with high strength threadlocker, so I know this works on my shaft, and that it lasts the lifetime of the sprocket (I use 2 front sprockets per chain). Glued? This may seem impossible, but it's not glued in the conventional meaning, no stickyness needed, only runny at first and hard after curing. The idea is to get rid of all air bubbles in the joint so that the "glue" has nowhere to go, and then the sprocket can't move. Don't let the length of my writeup scare you, this is actually very simple and takes maybe 1/2 hour. 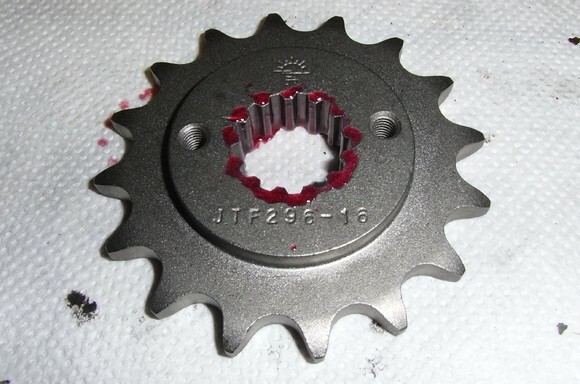 it gets very hard after curing, and is very easy to scrape off when changing sprockets. You can read the instructions pdf but you don't have to if you do as I say. This is the only one I've tried, there may be others better suited for more badly worn shafts. Strong threadlocker on threads makes a screw almost impossible to remove. The threadlocker between sprocket and shaft is intact after 12.000 km. My shaft (TA650 -02, at 75.000 km). 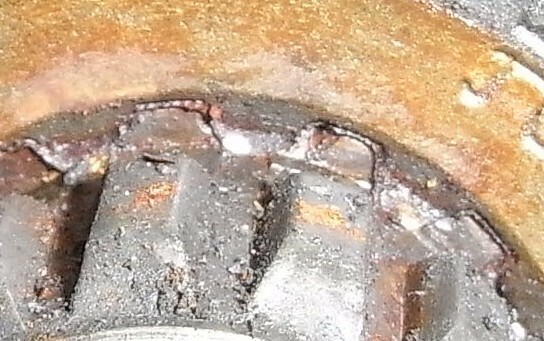 As you can see the splines are worn where the sprocket sits. Notice that one side of the splines is hardly worn at all. We will benefit from this when we centre the sprocket later on. Use thin wire to center the sprocket radially. A rubber band holds it in place. I have tried wrapping the wire on the sprocket instead, which is easier, but that doesn't work. There is no room for the wire on the shaft spline tops, only at the bottom (at least not with JT sprockets). A fresh and tight fitting shaft/sprocket joint may need no centering at all (guessing). If you're keeping the chain, just lift it off the rear sprocket. I had to remove the chain guard first. Tie the chain up so the front sprocket is free. The chain must not touch the sprocket while the threadlocker cures. Clean the shaft and sprocket with Bräkleen, gasoline or so. If you need a wire brush to remove rust, be careful with the shaft's rubber seal (you can cut a hole in a piece of plastic and slide it on to the shaft for protection). Find a suitable wire diameter. A tight fit is important, both for centering and later removal. 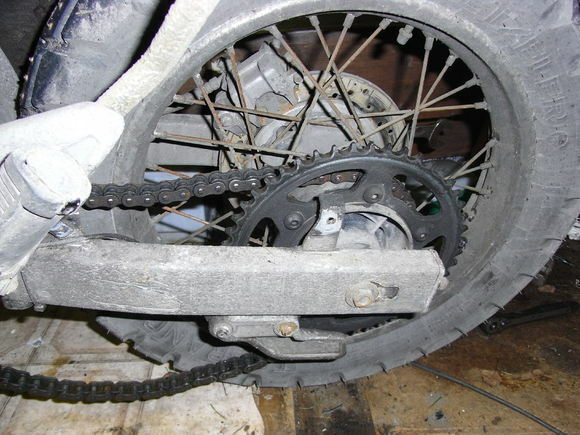 But not too tight, you should be able to move the sprocket by hand, as you will see below. I use 0,3 mm diameter with a JT sprocket. If this is your first time it is a good idea to first mount the wires and sprocket without locking plate and threadlocker, and start the engine to see how it looks. But remove it afterwards, no shortcuts now ;-) Next time you can jump this step. Some axial (side to side) wobble is ok. Radial (up and down) is not good, but that shouldn't occur. Now lean the bike to the right and put a little oil on the shaft next to the engine to prevent excess theadlocker fluid from sticking there and maybe ruin the seal. Smear threadlocker fluid on the shaft, wires and sprocket to wet all surfaces. Note that the "Permatex Red" cures in contact with metal, and that this goes faster in tight spaces. Therefore, fluid outside the spline joint can be liquid, even though it's fully cured inside the joint. You have about 10 minutes before it cures inside the joint, depending on temperature. With the bike leaning to the right, select neutral gear, put the sprocket in place, and add more fluid outside the joint as you turn and slide the sprocket back and forth a couple of mm to help the fluid trickle down and fill the splines completely. Never mind if excess fluid flows out behind the sprocket. Now select a gear and turn the sprocket counterclockwise to get its splines in contact with the undamaged side of the shaft splines. 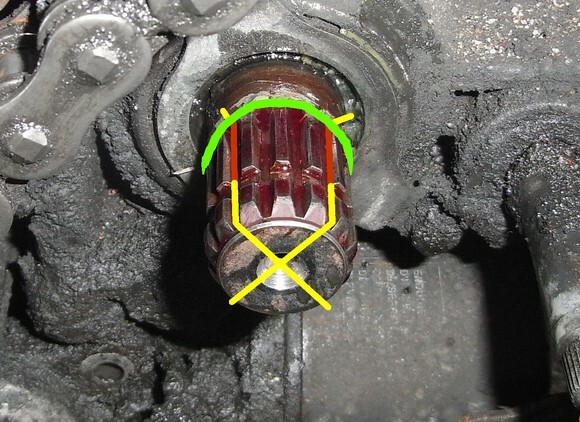 This gets them in line with the undamaged shaft splines outside the groove. And of course, make sure the sprocket is edge to edge with the locking plate groove, and better too far in than too far out, otherwise the plate won't fit. Gently put the bike back on the side stand, then leave it. You're done for today. 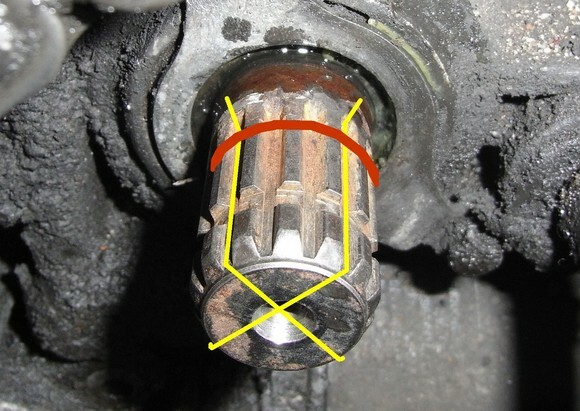 Do not remove excess fluid or cut the wires until after curing as this can disturb the alignment. This means you can't mount the locking plate yet either, but I see no point in doing that now, the plate/groove is probably too worn to do any good for the centering anyway. 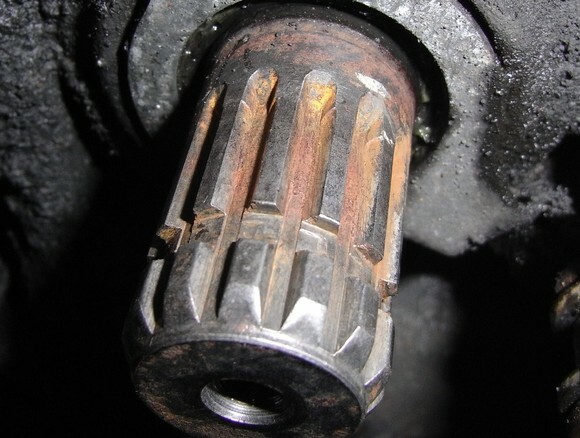 If the sprocket is not centered, or if its splines are not in line with the undamaged shaft splines outside the groove, the sprocket may be difficult to remove. But if centered and in line, just pull cold, no problems. Keep the temperature above 20°C / 68°F for good curing, and wait for 24 hours. Time to check the result - just start the engine and watch. Cut the wires with a knife or so (you can leave the wires behind the sprocket), and mount the locking plate, beware of threadlocker in the screwholes. Mount the chain and everything else. I let the threadlocker cure for an extra day before I drive, to be on the safe side. I suggest you do too. Next time you do this you just clean, lean, oil, wire, smear, trickle, align, done! I've had no problems removing my old glued sprockets with a cheap puller. Do not try to force the sprocket inwards, as this may damage the bearings!  cut it up with an angle grinder. But if centered and in line, just pull it cold, no problems. Warning: Be careful with strong threadlocker on screws you want to be able to remove. Thanks for this write up and putting your time into it. I have a TA with spline worse than yours and I plan on doing a fix similar to this. Thanks again. for the very astute and handy discription on how to. in german fat( friends of africatwins) are long threads about locktite 660. I have only tried "Permatex® High Strength Threadlocker RED", I don't know about Loctite 660 but it might work. But when I need a new bottle I would try Loctite 270; it seems good on paper and comes in 10 ml bottles. Could you give me links to the threads? I understand some german.